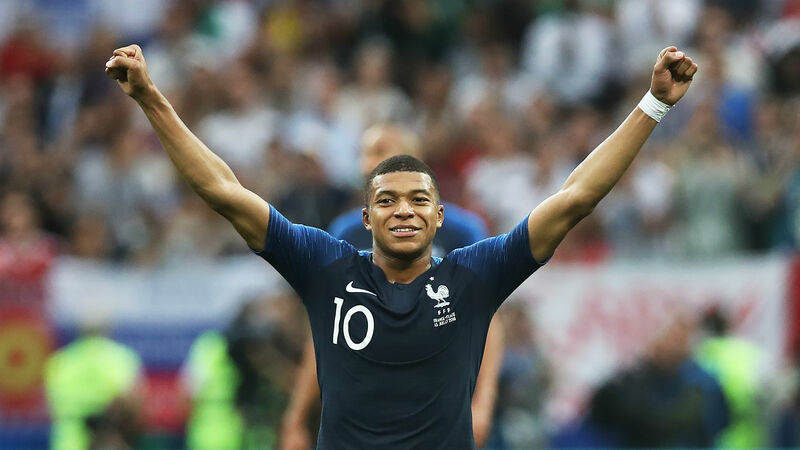 France superstar Kylian Mbappe played the final two games of their triumphant World Cup campaign with a back injury. The Paris Saint-Germain forward shone throughout the four weeks in Russia, producing a string of electrifying performances for Didier Deschamps' side and netting four goals. His campaign could have been ended early, though, after he picked up an injury prior to France's 1-0 semi-final victory over Belgium in St Petersburg. Mbappe was still troubled by the problem in the final against Croatia, but it was kept under wraps to ensure their opponents did not target the 19-year-old. "The bottom line was really not to alert our opponents because they could have taken advantage of that to attack me in this sensitive area," he told France Football. "That's why with the staff and the players we have hidden everything. Even for the final." Mbappe scored the fourth goal as France beat Croatia 4-2 to lift their second world title, his display only strengthening his position as young player of the tournament. Getting his hands on the trophy was no surprise for Mbappe, however, the youngster having believed they were destined for glory long before the finals. "You have to be honest," he added. "It had been some time since I had made this idea. "From the beginning I was convinced that we had everything to go to the end. "I said it even before the start of the tournament and some people took it for arrogance when it was just confidence. "I had programmed myself to win"